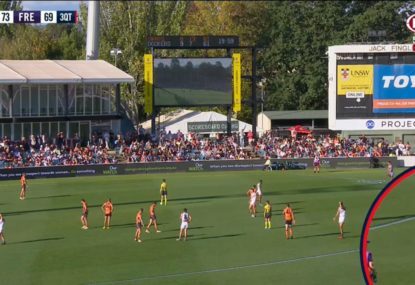 Australia’s AFL ‘Dream Team’ have been outclassed by their amateur Irish counterparts, going down 56-52 in the International Rules Test in Dublin. Ireland led for much of the contest but had to withstand a furious Australian fourth-quarter fightback, the tourists getting within three points with four minutes remaining before the home side grimly clung on for victory in front of 33,386 fans at Croke Park on Saturday. Australia looked best when stringing hand passes together and using their speed, but they struggled in front of goal and were taught a lesson by the Irish when it came to accurate kicking. While Ireland landed three of the six-point majors, Australia nabbed just the one goal – focussing more on building their score through the three-point overs. In chilly four-degree weather and playing with the unfamiliar Gaelic football, Australia were cruelled by wayward kicking – finishing with 13 one-point shots at goal compared to Ireland’s five. 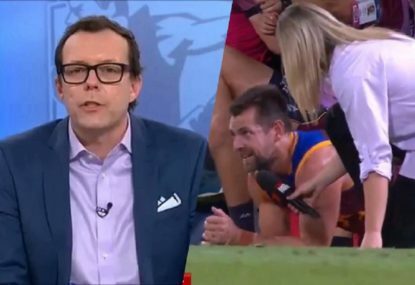 But they roared back into the contest when a scrappy six-pointer, punched in by Eddie Betts, was followed up by an over to Robbie Gray – his third of the night – to reduce Ireland’s lead to three points. 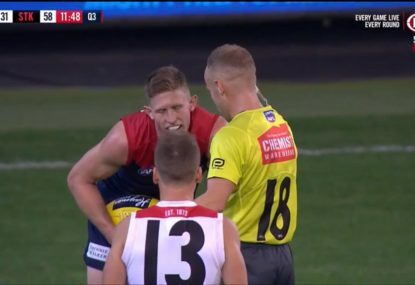 Betts, with a goal and two overs, was Australia’s best alongside St Kilda star Nick Riewoldt, who kicked three overs and a behind for a personal haul of ten points, and defender Harry Taylor. Ireland’s free-flowing style proved hard to stop in the opening half, and their ability to convert territory into six-point goals proved decisive as they kicked three majors to take a 43-23 lead into the big break. Retiring Essendon champion Dustin Fletcher was at fault for the opening goal of the match, the Aussie goalkeeper failing to clear a well-placed cross which was soccered into the net by Ireland’s Aidan O’Shea. Fletcher could do nothing about O’Shea’s second however – having rushed out to make a crucial save, he was out of position as the Ireland star shot low and hard into an open net at the start of the second quarter. That goal had halted an Australian revival, built on a steady flow of three-point overs, but it set the tone for the remainder of the half as Ireland finished the stronger. 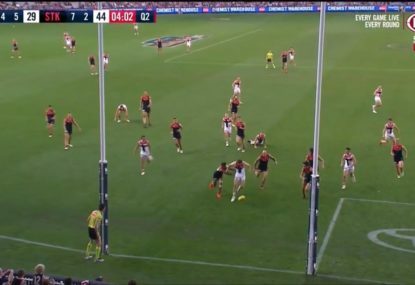 Australian captain Luke Hodge was warned over foul play late in the half, and gave away a penalty for body-checking Conor McManus into the goalpost. McManus converted the penalty, sending Fletcher the wrong way, to push the score out to 40-22 with the home side well on top. The nightmare continues for Melbourne. 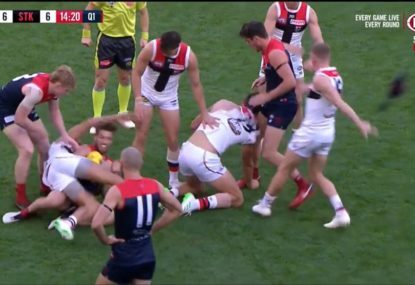 Another off the ball incident will likely be looked at by the MRO. 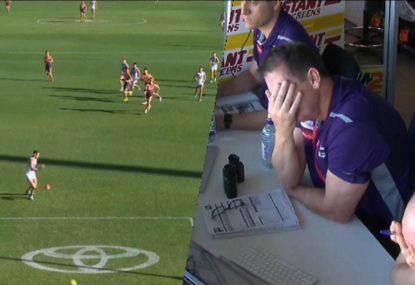 Ross Lyon’s reaction says it all!